» Health Care Complaints Commission to investigate the AVN. Today it was revealed that the AVN will be investigated by the New South Wales Health Care Complaints Commission for breaches of the Public Health Act of 1993. 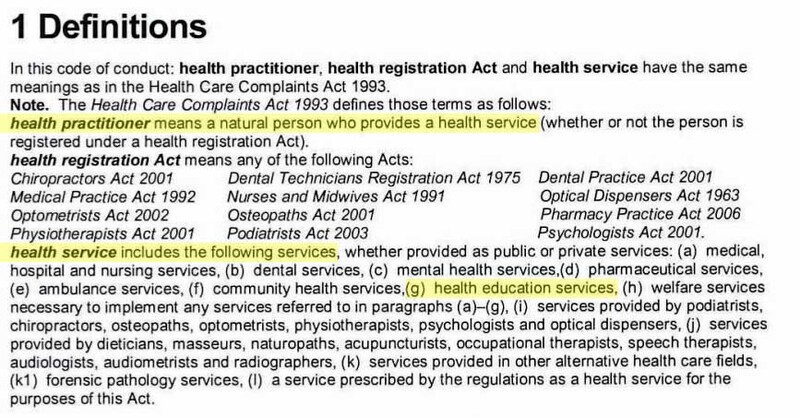 “The complaint alleges that both the AVN and myself, Meryl Dorey are “health service providers” because we are “providing health education services to the public” for the purposes of the Health Care Complaints Act 1993 (NSW). Meryl claims that; “Neither the AVN nor myself Meryl Dorey are health practitioners as the term is generally understood colloquially nor have we ever claimed to be”. Well that maybe so Meryl, but this is not about whether you “colloquially” perceive yourself to be a health service provider. There are in fact laws in NSW which define practitioners, and it seems to the me that both the AVN and Meryl Dorey could well fall under this jurisdiction. Below is the relevant section of the Code of Conduct defining a health service provider, released in August 2008 by the Health Care Complaints Commission. I think it is quite reasonable to interpret the lectures, seminars and webinairs conducted by the AVN as “health education services”, even if the information they disseminate is deluded and verging on dangerous. The complaint has been thoroughly and diligently prepared. 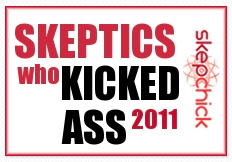 I urge you to check out the entire document in pdf form here. Below is an excerpt from the AVN newsletter released today. 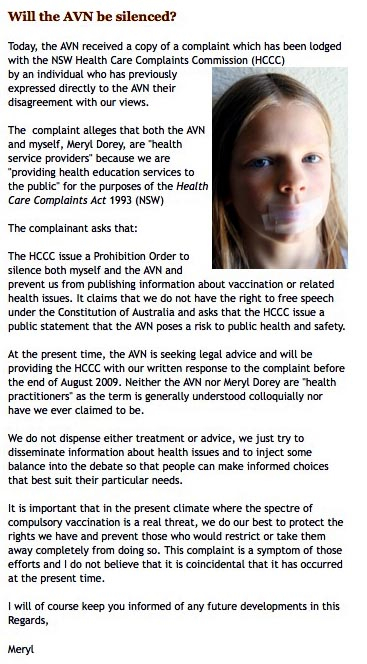 » The full complaint to the HCCC about the Australian Vaccination Network.